I’ve been working with our team learning Apple Configurator as our district deploys iPads. The following is my understanding of how the program works and some suggested ways each piece will benefit particular configurations of use for the iPads. This is not a perfect document. It is simply what I have learned through experience and asking Apple Engineers and searching the internet for information. Hopefully this will offer insight to others. DO NOT Plug into Configurator yet! You setup one iPad by acutally touching it. If you ever need to restore the device, you can use this backup to get it to the base settings and then just add the apps you want on it. It will prevent the user from needing to go through the setup process from a reset device. This is where Apple Configurator makes all the iPads uniform. Same OS version, same profiles (network credentials, email, restrictions), naming scheme, and determining the apps you want on the devices. This area will push the device name on to the iPad. The number sequentially feature is especially nice. When you type the device name you, whatever number you place at the end of the name will be the number that it uses to start sequencing the iPad. This is also where you choose to have the iPads have “supervision” which is different than the “Supervise” section of configurator. Essentially, “supervision” puts a certificate on the iPad that prevents it from syncing with any other computer unless you completely reset the iPad (“Erase All Content and Settings” in the Settings App). The supervision setting is ideal for a classroom set of iPads where the teachers has a Macintosh computer to sync the iPad regularly. If the Mac is not in the same room as the iPads regularly, I wouldn’t advise using it. You can choose which version of iOS you want to load. I recommend keeping your iPad in the latest iOS. If you want to use an older version, you will need to have the file on your Mac and to be able to associate it to Configurator by choosing “other” and clicking on the “+”. The erase before installing feature will take a while for each device (around 15 minutes). If you are in a hurry, leave the iOS piece alone. This is where the backup of the one iPad comes in. Use that backup to restore all devices. Reasons are described above in NEED TO KNOW. I could write a whole other document about this one… it looks just like iPhone Configuration Utility. Will describe this more in a later post. These symbols allow you to import, remove, and export a “Prepare” profile respectively. Click this button at bottom of screen and you will “prepare” all the iPads that are plugged in. After the profiles, names, and iOS is installed, you have a choice, move on to Supervise or Prepare Apps for all iPads. If you want all the same apps on every iPad you are preparing, then go to the Apps Tab, if not, Supervise. Plus will allow you to add app files (.ipa) to the configurator; Minus, removes. These you can install on iPads all you want and it will allow you to ALWAYS install them on all iPads. NOTE: IF the app was free when you downloaded it on the Mac, BUT then becomes a Paid app, you will LOSE the free app privileges IF you ever erase the .ipa file for that app from your Mac. These apps are not in the Apple Volume Purchasing Portal (AVP) because they are free to download. As a result, the in-app purchases cannot be purchased through AVP. The best solution advice I’ve received from Apple is to talk to the developers and request they created a version of the app that is a Paid app and then it will automatically show up in the AVP. “Purchased” when it was free on another device and then downloaded on the Mac once it became a Paid App. The Paid Apps are easy to spot in the Configurator, they have a number (initially “0”) next to them. When you add a paid app to Configurator it will prompt you to add a spreadsheet of redeem codes in order for Configurator to maintain licensing agreements for you. For an enterprise, EACH iPad should have a redeem code associated with it. The redeem code spreadsheets will come from your AVP Facilitator. They log into the AVP and purchase the quantity of an App correlating with the quantity of iPads you want to have that app installed. Configurator will keep you honest. If you don’t have enough redeem codes in configurator, you will not be able to install the app on all your iPads. Please note, the spreadsheet can be modified as long as you keep the format the same. In fact, it is best to modify any spreadsheet that has some apps that were already redeemed and it is noted in the spreadsheet. This section will allow you to push the profile(s) you created in “Prepare” onto the iPads. Groups of iPads can be created where unique profiles and apps are pushed onto the iPads of that group. Supervised Devices: This area will allow you to create groups of iPads that you are supervising with different apps and profiles. Click the “+” to add, “-” to delete groups. Click on the group to rename. Once you have groups you want, you can drag any iPad in the middle column into any of the groups. This could be useful for a scenario where the school has one Mac supervising many iPads. They will be able to create groups of say grade levels or subjects that sets of iPads are assigned to and assign specific apps to each group of iPads. From here you are doing the same things as you did in the Prepare section, however, now you have the options to customize across different groups. All the settings and apps tab descriptions above still apply. This is when you will see the number of copies of each paid app decrease. At this point, you can unplug the iPads and distribute them, unless you want to manage the data and customize the iPads for each user with a profile photo and such in “Assign”. I’ll add to this later… after I experience it a little more. Thank you for this! I’ve been working my way through learning Apple Configurator and this is a big help! Do you have to use the original compute to erase the setting to move the supervision authorization/certificate to another computer? You can remove a supervision profile on an iPad without the original computer by erasing all content and settings… Most of the time. I have had to put them in recovery mode before it was removed before too. Thank you so much for your post! We’ve been trying to set up a cart of iPads and after much frustration with iTunes and then Apple Configurator, we found this blog. It was so helpful and by far the best information available for getting the process to work. When updating either iOS or App of a supervised device in configurator does the device retain the app data or user data during this update? I want to make sure it is really handled as an update and not a new install. 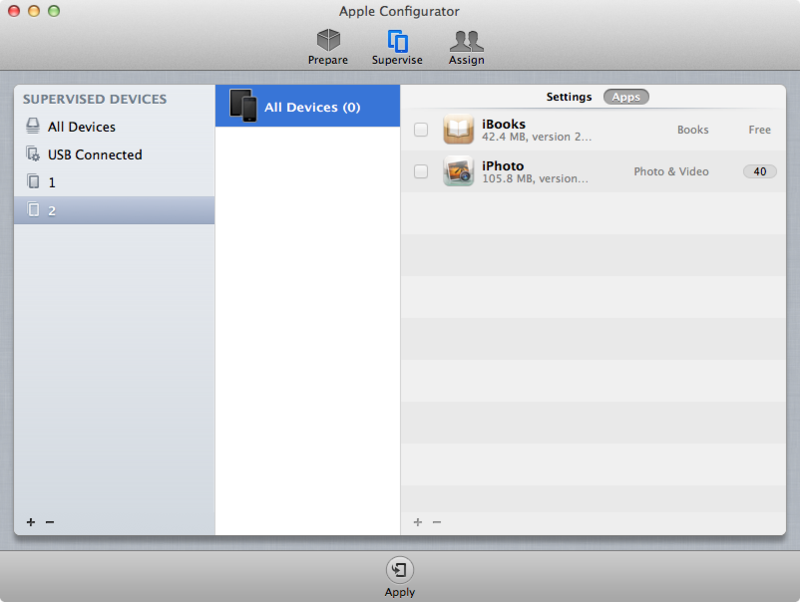 Updating in Configurator does not remove data as long at the iPad is already supervised on that Mac. When using VP for apps I came across what I called the “what came first the chicken or the egg” syndrome. How did you get a VP App in configurator without using one of the codes? You have to start somewhere! I would buy apps through VP and get ONE in iTunes by using ONE code. Then I would import that app into the configurator by using the + sign at the bottom of the Apps tab and I would import the VP paid app. (this is also how I import updated apps and over write the older version) Then I would see the (0) next to the app name and can import the spreadsheet. The problem begins here where I used ONE code it would not reuse it and would say I was one short. This was quite annoying as I couldn’t see how to get it in the configurator without using one code! After talking with Apple I found out that after you download the VP App one time you have to download the VP spreadsheet a second time to be able to reuse that code! I was skeptical about this solution but gave it a try anyway and after examining the second spreadsheet found it to be quite different. I discovered that Apple knows where every app is and marks it. So when you import this second spreadsheet it knows that you are only REusing this App and it allows you to do so. Amazing isn’t it?